This gate was first recognized by James Barclay, an American consul in 1855. It is referred to as the Kiponus Gate in the Mishna. This large stone (which looks like a square) is itself about 21 feet long, 6.5 feet wide, and weighs 50 tons. This stone was the massive lintel (or, top stone) that spanned a gate into the temple of Herod's day. The gate entrance was almost 27 feet high. 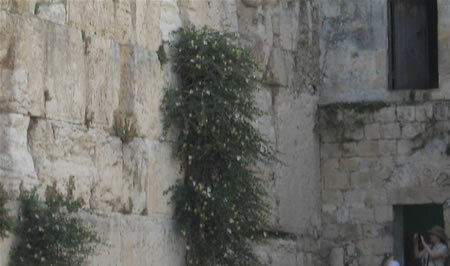 The building to the right was attached to the Western Wall and was originally part of a ramp that led to the Mugrabi Gate, which was above Barclay's Gate. The lintel can be seen from the inside of the building. 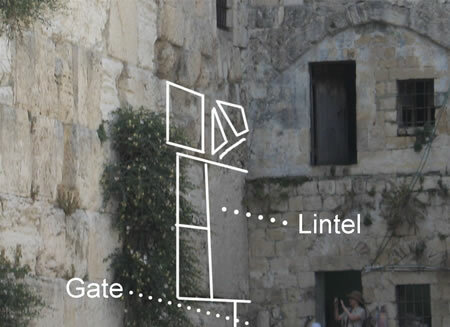 Below the lintel, before the building was added, the gate was closed in with smaller stones The gate used to enter the Temple Mount today is above the lintel of Barclay’s Gate and is called the Moroccans’ Gate, the Gate of the Moors, or the Mugrabi Gate. 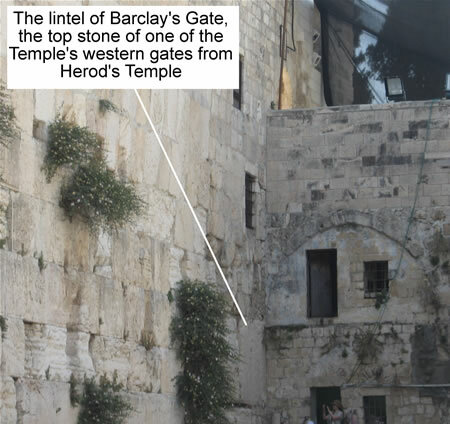 Barclay's Gate was one of four entrances to the Temple Mount from the west side. 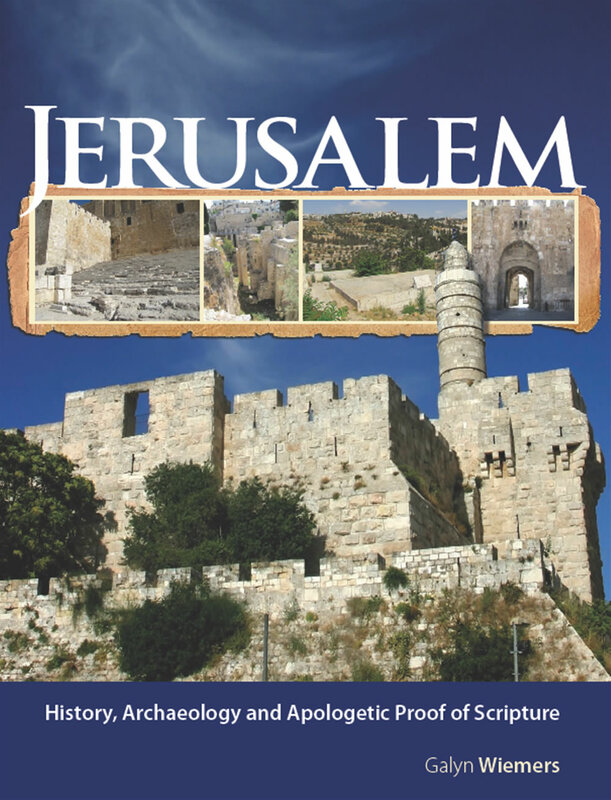 It would have connected to the surface of the Temple Mount through a tunnel with a staircase similar to Warren's Gate. 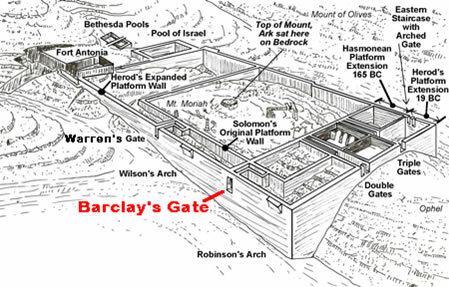 Wilson's Arch and Robinson's Arch would have carried the worshippers directly to the surface while Barclay's Gate and Wilson's Gate would have used an underground staircase to bring worshippers to the Temple Mount. This gate was recognized by Barclay, an American consul in 1855. It is referred to as the Kiponus Gate in the Mishna. This large stone (which looks like a square) is itself about 21 feet long, 6.5 feet wide and weighs 50 tons. This stone was the massive lintel (or, top stone) that spanned a gate or entrance into the ancient temple of Herod's day. The gate entrance was almost 27 feet high. 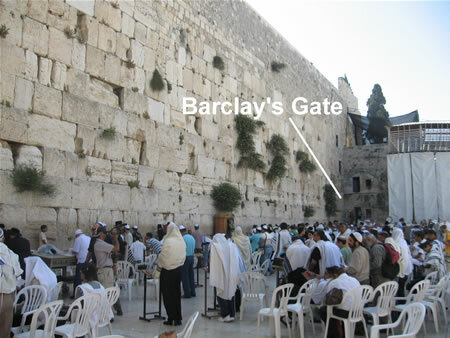 The building that sits on the right was attached to the Western Wall and was originally part of a ramp that led to the Mugrabi Gate that is above Barclay's Gate.. The lintel can be seen from inside this building. The stairway is still on the other side of the wall and still leads to the Temple Mount. This staircase is accessed from the Temple Mount just north of the Mugrabi Gate. The Muslims descend these stairs today to a room they call El-Buraq Mosque.